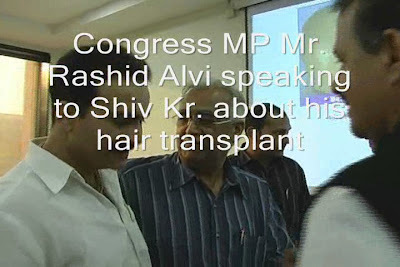 One of the patients present at the hair transplant live seminar was Shiv Kumar. Shiv had undergone 1500 FUHT and 87 body hair grafts. He met with many members of the public and press who examined him closely. He also met the Congress MP and spokesperson Mr. Rashid Alvi. 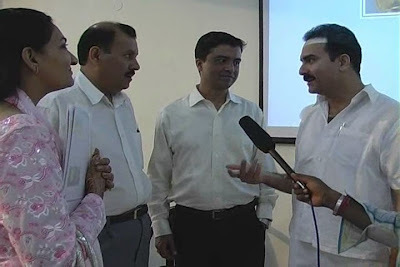 A video recording showing the excerpts can be seen at the link below. Following are some pictures from the seminar. We shall be posting additional pictures later. I am unable to upload videos of larger than 7 mb on the site even though the capacity mentioned is 25mb. If you wish, please upload the video on your server and also let me know when the problem gets fixed. Sorry about that. My programmer is still working on the forum. Can you email me the video at hairsite@aol.com ? I will upload to the server for now until all the forum issues are resolved. Good video. Where can I see the complete seminar/. » Good video. Where can I see the complete seminar/. I would like to see the seminar as well.